I am so happy to finally be posting this piece. 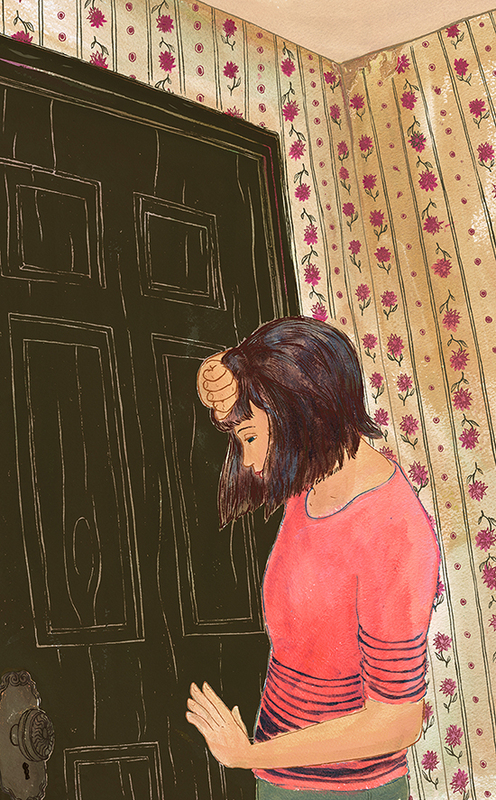 It is a personal piece that started as a sketch for an editorial assignment. Why waste a good sketch, am I right? This piece was done in ink and then separately in acrylic. It can be a huge challenge to put the two together after the fact, but it yields some satisfying “happy accidents.” Sometimes I think I try too hard to make things cleaner and more perfect than would be my natural tendency, so I’ve decided to embrace that tendency. Especially when I’ve been swamped with work lately and have an 11 month old on the verge of walking (which reminds me, a Back to Work with a Baby post is WAY overdue) – it doesn’t leave a lot of room for working against my own inclinations. Seeing other artists’ process images always interests me so I want to start including more of them in my posts. If you look closely at the above ink drawing you can see where I made some changes/corrections. Maybe I should start a new game – find all the changes! Below is a color comp I did before I started the final. If you don’t currently do color comps/thumbnails when you’re starting a new project, you need to start. They make a huge difference and give you a chance to play around with the colors in a stress-free way. I need that roadmap when I start painting and so that I don’t follow a crazy filter rabbit hole in Photoshop on the back end. This week the August issue of Prospect Magazine was released and I am pleased to share an illustration I did for a fiction piece in the issue called “Flight” by Tessa Hadley. 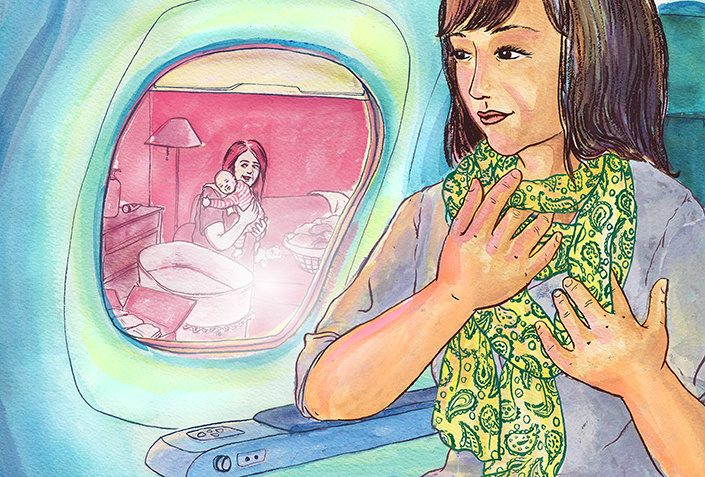 The story is about a woman who returns to the UK on business and takes the opportunity to meet her niece’s baby and to try to repair her relationship with her estranged sister. My favorite part of this whole piece was creating the paisley pattern on the scarf. I love inking and/or painting imperfect patterns. It’s so satisfying to see the detail give the element a little more life and shape. You can see the last illustration I did for Prospect Magazine here. Architectural illustration is not a field I expected myself to be in one day, but after I created an image for my alma mater’s Christmas card last year, it seems to be something I have a knack for. I have done a bit of work for other universities (and if you’d like me to paint something for yours, get in touch! ), but this painting was a little something different. 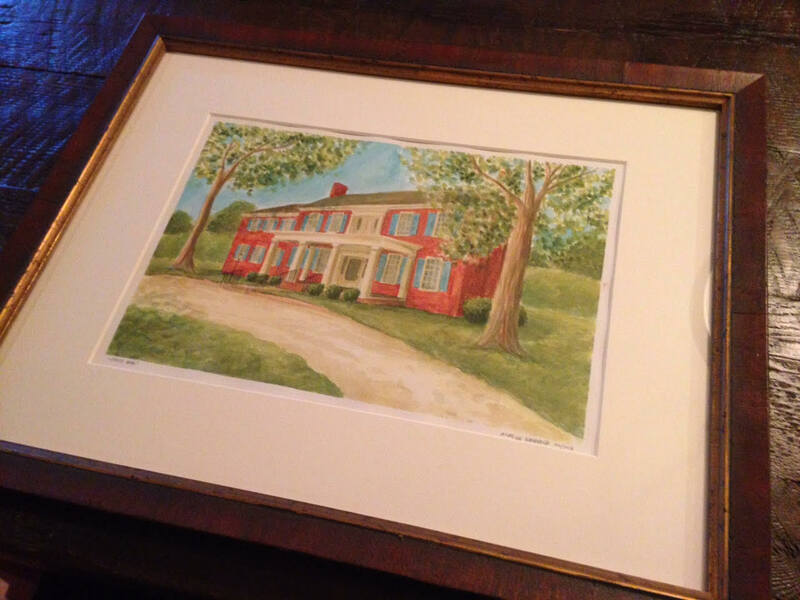 A friend of mine commissioned this painting of her boyfriend’s grandmother’s home as a birthday gift. 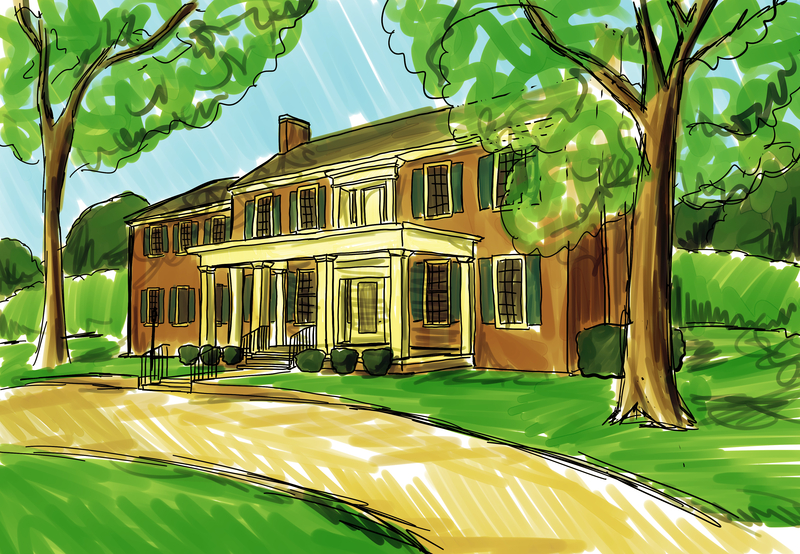 It is a house with a name – and who doesn’t want to live in a house with a name? Meet Daisy Hill. I’m told her boyfriend loves it. This painting provided me an excellent opportunity to make the piece EXACTLY as I wanted it with no digital manipulation since the original painting was being framed and given as the gift. I often tweak colors or saturation levels digitally because I can be a bit timid with those things when I’m painting but there was no room for that this time! Below are some of my sketches and color studies that I sent to my friend before beginning the final painting. It has been quite a while since my last “Back to Work with a Baby” post. I suppose that’s what happens when you try to continue working from home – with a baby – and then try to add some extra blog posts on top of that. So now our little one is almost 7 months old and things are starting to normalize – at least until she’s mobile. As I’ve mentioned previously, finding the time for both my husband and I to get our work done has been one of our biggest challenges. We’ve both had very busy first halves of 2015 and hopefully the rest of the year continues that way. But for me, that has meant a real lack of alone time to do anything other than client work or promotion. And when I do find myself with a bit of time, I can’t use that time very well when I’m home and the baby is home. Even if my husband is taking care of her for a few hours I find it difficult to let my mind ignore what they are doing and just have some fun with my sketchbook. 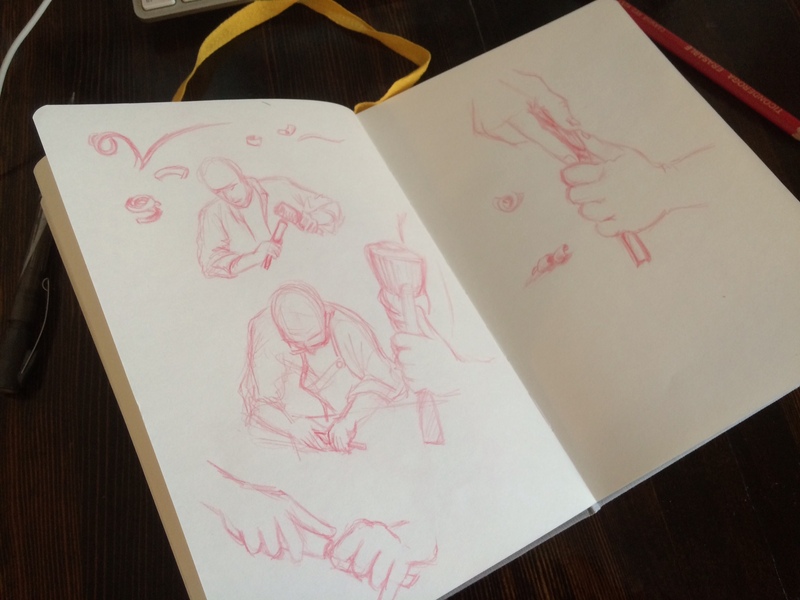 Yesterday I had the chance to get out of the house with just my sketchbook (and John Hendrix‘s Drawing is Magic). 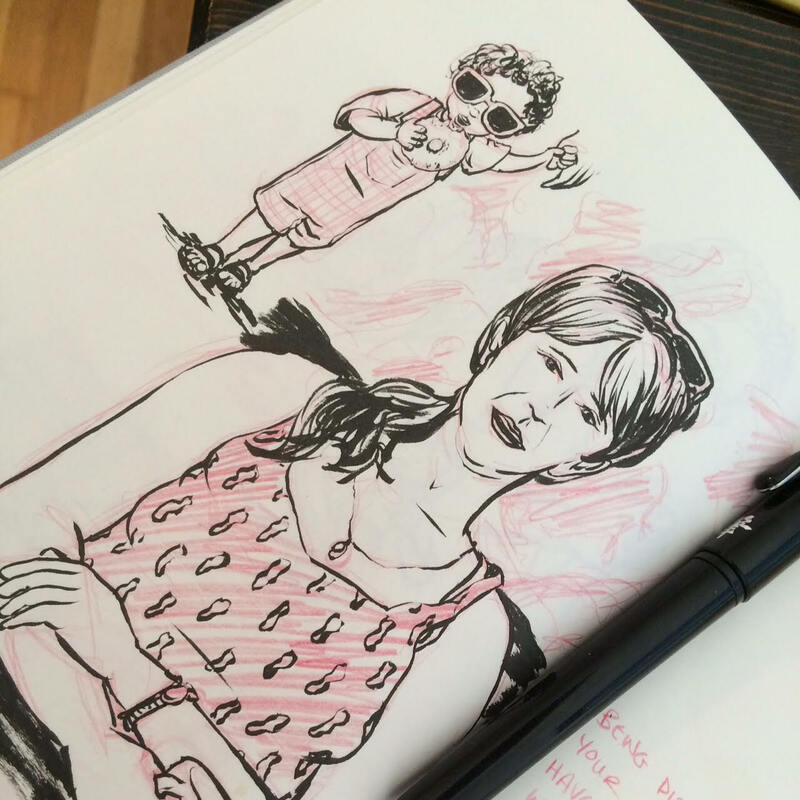 I took a long walk (despite the threat of 90 degree weather) to a coffee shop and just sat and sketched some people around me. And when they all got up and left, I played around with Drawing is Magic. It felt SO GOOD to be out by myself and to be doing whatever I wanted for a couple of hours. It would seem like I should have been able to do that before now, but between my work and my husband’s work, the free time I have had usually went to chores or simply lying on the sofa, exhausted. Even though I was only gone for about two hours yesterday, I found it incredibly rejuvenating. It’s something so simple, but something that I think will help with my creative energy despite being so tired all the time. And again, it seems so obvious, but making my free time away from the apartment more of a priority will allow me to be happier in the face of a very stressful time in our lives. Did I mention we’re moving to Providence? So there’s that as well. 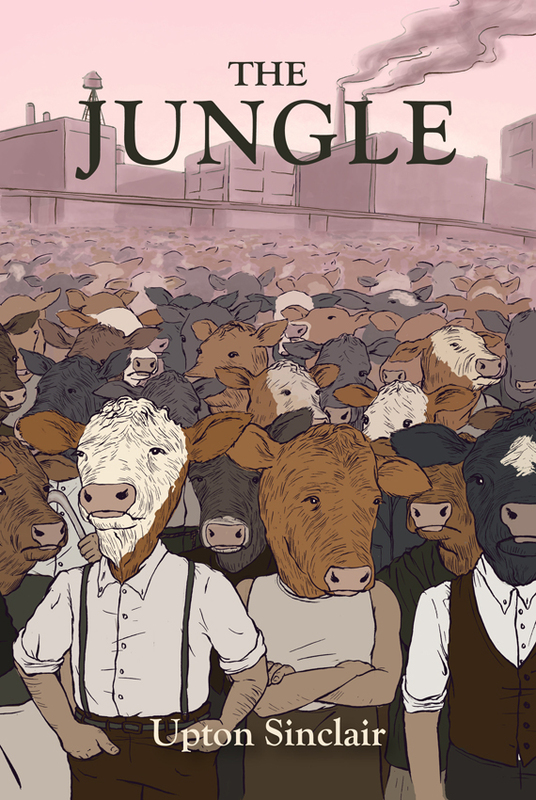 A couple of years ago I created my own book cover for The Jungle by Upton Sinclair for a project called “Recovering the Classics” over at the Creative Action Network. Last week I learned that Recovering the Classics is partnering with the New York Public Library and the Digital Public Library of America to create a pop-up gallery of some the book covers, mine included. The exhibition will take place this Friday, May 29th from 6:30pm – 9:30pm at the NYPL. You can RSVP and get more details here. I’m so excited to be a part of this and I wish I could be there for the show. It just so happens that I’m in New York now but will be leaving tomorrow. So, if you happen to swing by, take some pictures and send them my way! Last week, I had the pleasure of working on an illustration for Prospect magazine for a story that hit very close to home. 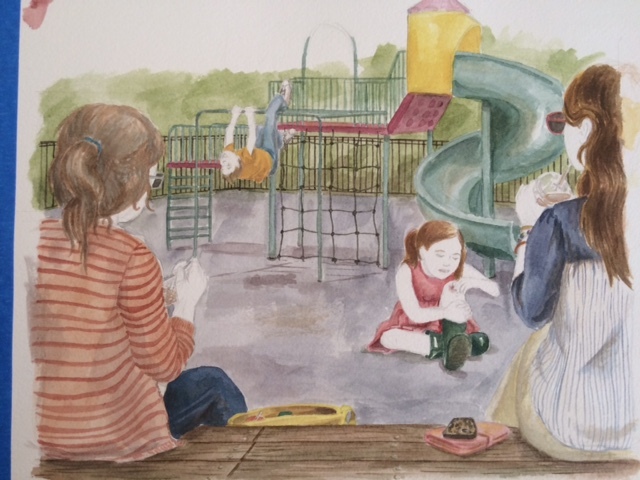 The piece is a short story titled “Animal, Vegetable” by Kate Clanchy that is about “you” and your slightly higher achieving friend with the perfect life and the seemingly perfect daughter. 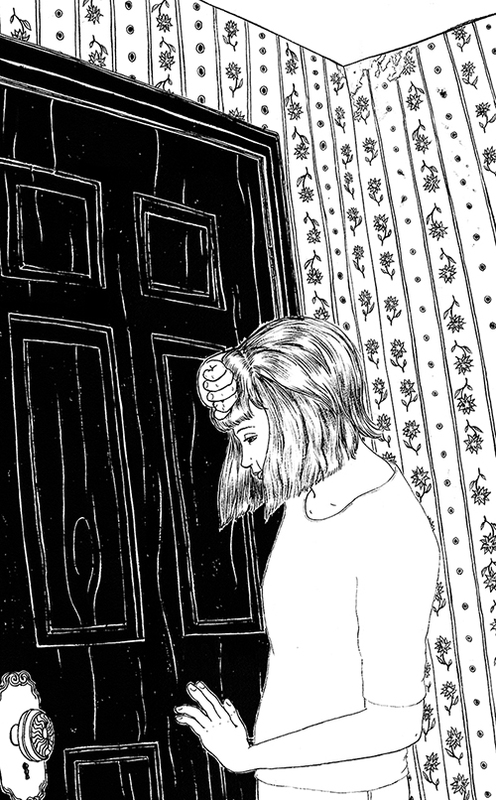 Without giving too much away about the short story, it really tugs at the heartstrings of anyone with children so the fact that I have a six-month-old at home meant that I felt the pain of this story very intensely. I’m very happy to have had the chance to work on a story that I could connect with so personally. 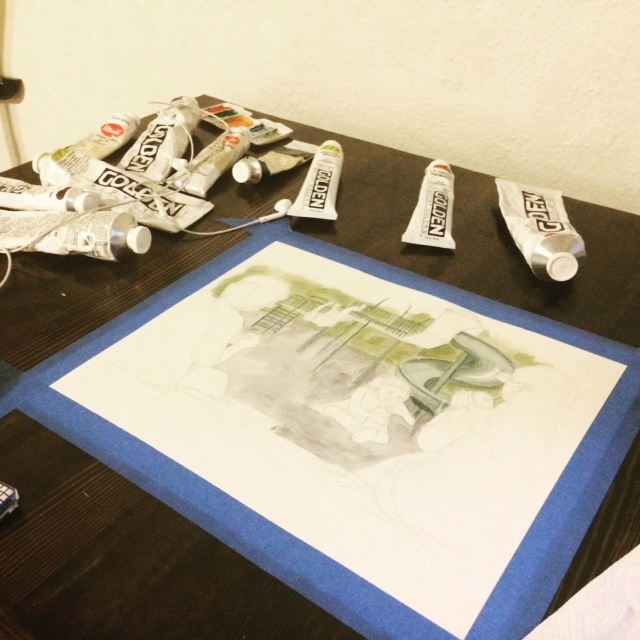 Below are some process shots of the painting. Thanks to Creative Director, David Killen. In this instance, painting in the background first was surprisingly satisfying. The figures as just negative space were striking. So much so that the thought crossed my mind that I should leave it this way. And below I briefly considered leaving all the flesh tones white to give it a more stylized look but, ultimately, it looked better completely painted in. It does make me want to try some of these techniques on future illustrations, though. 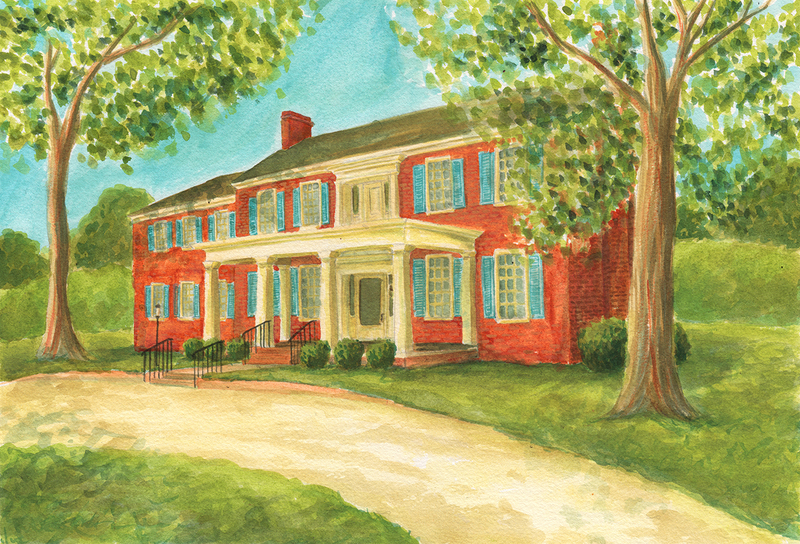 You may have already seen my recent cover and interior illustrations for The Writer’s Chronicle. Sometimes when you send your art director sketches there is more than one that you want to take all the way to the final. That was the case for this cover assignment. 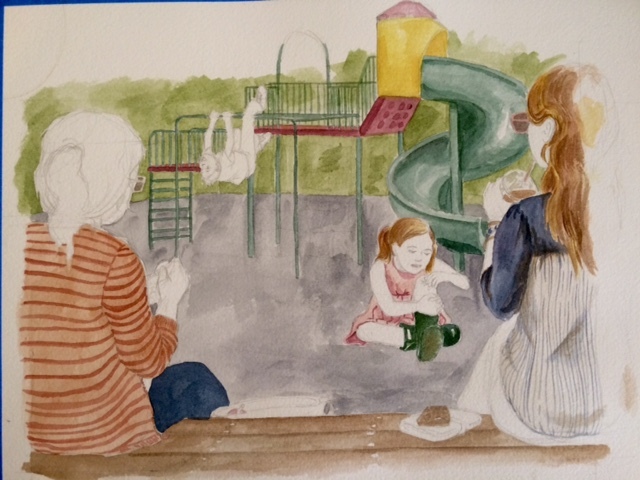 Amongst a very busy season and taking care of a six month old (my adventures in freelancing with a baby are being chronicled here), it took me several months to finally finish off this painting. And it was worth the wait. I feel I really was able to push my composition with this in a way that paid off. If you didn’t see the original cover, it went along with an essay on Henry James and his craftsmanship on The Portrait of a Lady. As per usual, I made some digital tweaks, but the original painting is not far from this version and is for sale, so please get in touch if you are interested. I intend to write another baby-related post in the near future, but even my good friends are due emails or visits so I will get to it as soon as I can. 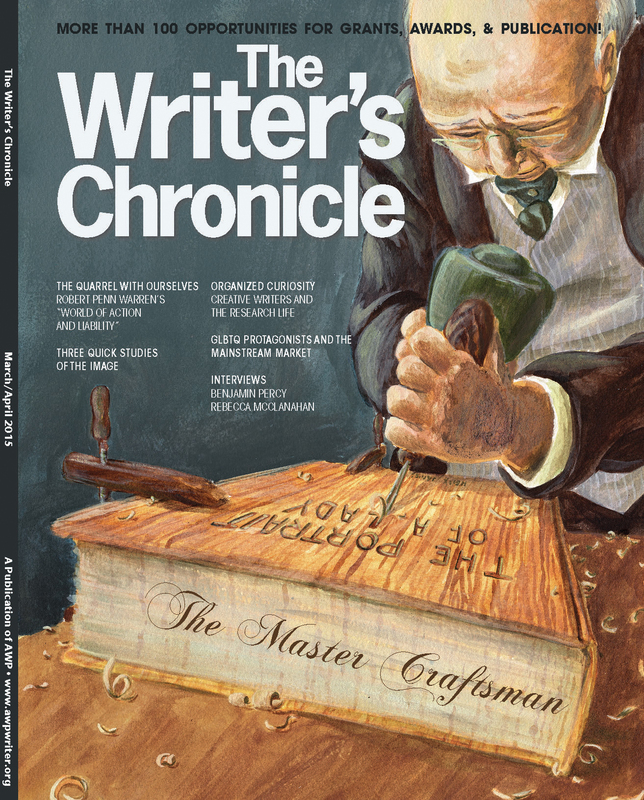 In February, I had the great pleasure to work with The Writer’s Chronicle for a second time. 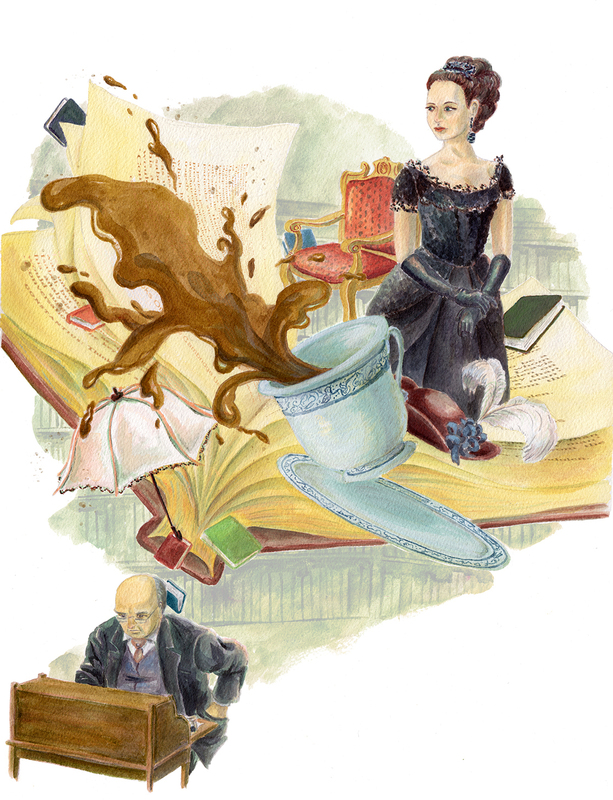 I created a cover illustration for an article titled “The Master Craftsman” which was about Henry James and how he crafted The Portrait of a Lady. As you can see, I chose to depict James as a literal craftsman, carving the novel out of wood. The second illustration accompanied an article titled “Three Quick Studies of the Image” and discussed the role of the image in poetry. 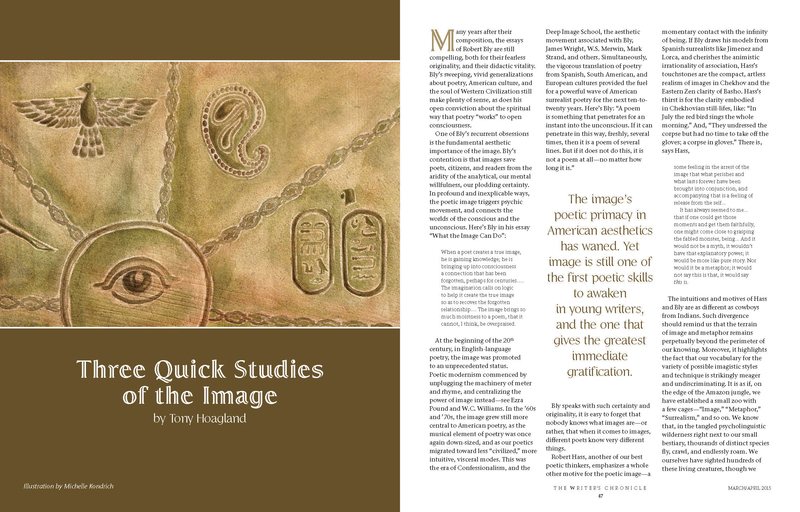 This was particularly challenging given the abstract nature of trying to illustrate “the image.” I decided to explore a concept using ancient stone carvings and hieroglyphs as they related to language and communication. 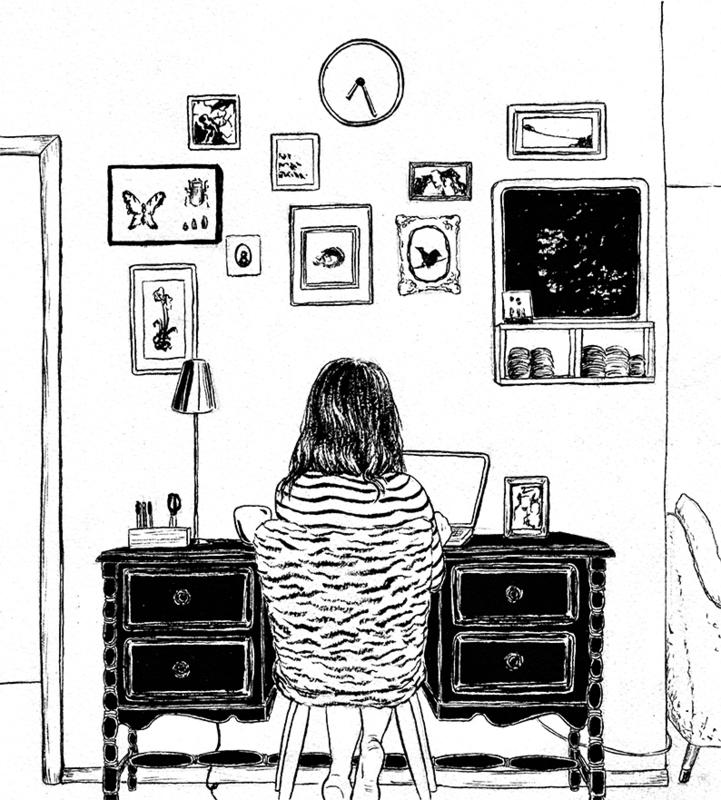 The folks at The Writer’s Chronicle are always so great to work with and they have typically given me a lot of freedom with the illustrations. And this issue was especially well-timed because it came out during the annual AWP Conference & Book Fair so hopefully a few extra eyes were on the issue. You can see the cover and interior illustrations I did for them in 2013 here. For the last couple of weeks I’ve been doing some on-site whiteboard work for a local ad agency in the morning. It’s been great to be so busy and to have a chance to get out of the house. Of course, this has put added pressure on my husband who went a week and a half without a morning to himself. While the timing actually worked out quite well for the on-site work, it was frustrating to feel like I had to limit the number of hours I was away. This was for a few different reasons. My husband teaches and has other work as well, so he needed to be gone most afternoons. Not only does that mean that he needs the car, but someone obviously needs to be home with the baby. Also, since I am breastfeeding I need to be home to feed the baby or at least take a break to pump (sorry if that’s TMI). Being gone all day without pumping is not an option. I’ll give you an update on our child care situation in a bit, but first I want to talk about how difficult it can be to present yourself professionally when you need to schedule around the baby and the baby’s naps. Phone calls present the biggest challenge. If I try to schedule them when the baby might be napping, it’s a total crap shoot. If she does happen to be napping that’s great, but if she wakes up mid-call and I’m here alone with her that’s a problem. The person on the other end of the line will very likely hear her crying as I go to pick her up and my attention is then divided. And if they need to reference an email or document, I’m away from my computer and/or standing and bouncing with a potentially hungry baby. Typically that’s the worst of it, but even if my husband is home to watch her while I’m on the phone, we have a small apartment. If the baby is fussy or crying, there’s really nowhere for me to go where she won’t be heard. It’s a bit embarrassing when I’m speaking with a client or potential client and I have to apologize for the baby. Of course she is my ultimate priority right now, but I don’t want my clients to feel as though my attention is too divided to do their projects justice. The truth is that it’s not affecting the quality of the work that I am producing and they shouldn’t have to worry about it. When it comes to scheduling, my main approach is to simply not mention why I may not be available at a particular time. 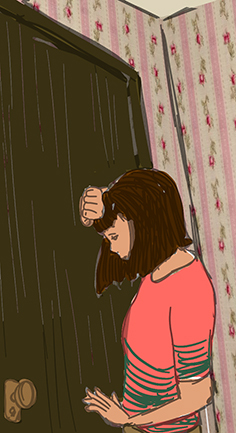 Illustrators’ schedules vary so widely that we shouldn’t be expected to be available to start a project immediately and to work on nothing but that project until it’s done. I am a people-pleaser, though, and I often will try to give my clients that sort of attention and availability. But now, more than ever, I need to be firm about my schedule and there is no reason for them to know when I’m scheduling around another project and when I’m scheduling around the little one. Fortunately, we have found a babysitter we like. She’s not always as available as we’d like during the day, but it’s certainly a start. It’s a bit strange to be home with the babysitter, but we’ve been having the kind of weather that has allowed her to take the baby out to the park for an hour or two while I’m home working. We found the babysitter through SitterCity. There are a few different online babysitting services and we’ve only tried this one and happened to hire the first babysitter we interviewed, so I can’t really provide much of a review. We are still looking for another sitter who might be available when our current sitter is not. What’s wonderful is that our baby is now over 3 months old and is a constant source of joy and laughter. She smiles constantly, laughs if you tickle her just right, and wants to talk to you all day long. Her new interactivity means that getting work done when she’s awake is even harder, but it’s totally worth it. Many of you read my post a couple of weeks ago about getting back to work now that I have a baby. This is the second in what will be a series of posts on the topic. 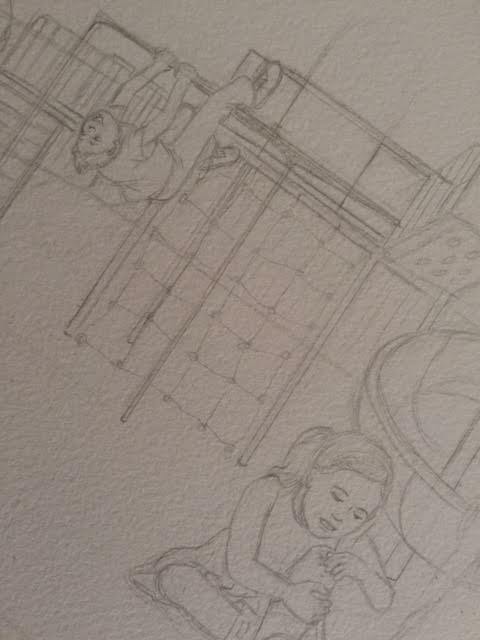 Thankfully, some of the fear that I was experiencing a few weeks ago was pushed aside by new work coming in. I’ve received my first editorial assignments for the year and that gave me an easy way back into sketching without the pressure. Actually, sketching for some of these jobs has lead to more sketching than I would normally have done. Working on some practice sketches for the final illustrations felt really, REALLY good. The fun and pure enjoyment of drawing is back and is stoking my creative fires. And now that we have a two-month old who is basically sleeping through the night most nights (until I post this, then she’ll probably quit!) I’m a lot more rested. With the influx of new work has come a different baby-related issue that we hadn’t expected to deal with so soon and that is the division of labor. I don’t mean the division of labor around the house, though that’s an issue that I think every couple with a new baby has to work through. I mean the division of time spent with the baby and time spent on our own work since we both work from home most of the time. Our little one is now spending a lot more time awake and alert, which is great for getting lots of smiles, new sounds and crazy faces, but makes it much more challenging to get work done. Those awake times often require a lot of holding, and, of course, we want to be engaged with her as much as we can. Working towards non-traditional and creative careers means that paying for daycare or a nanny is financially beyond our reach. We have friends and family that can help out here and there, but we will need to sort out some sort of long-term plan. Sometimes we put her in our baby carrier so she will nap or hang out while leaving our hands free, but it’s still limiting. Her naps are really our saving grace, but they are not at all predictable yet in terms of how long she will sleep. We do our best to take shifts, but at a certain point she’s hungry and I am the only source of food (fitting in time to pump so that my husband can feed her is another issue entirely). I guess what I’m saying now is that we simply don’t have a plan that’s working yet. I wanted to share this despite not having any real advice to give on the matter. Our solution for right now is my mother coming to stay with us for a few days–maybe she can offer a bit of wisdom on the subject. 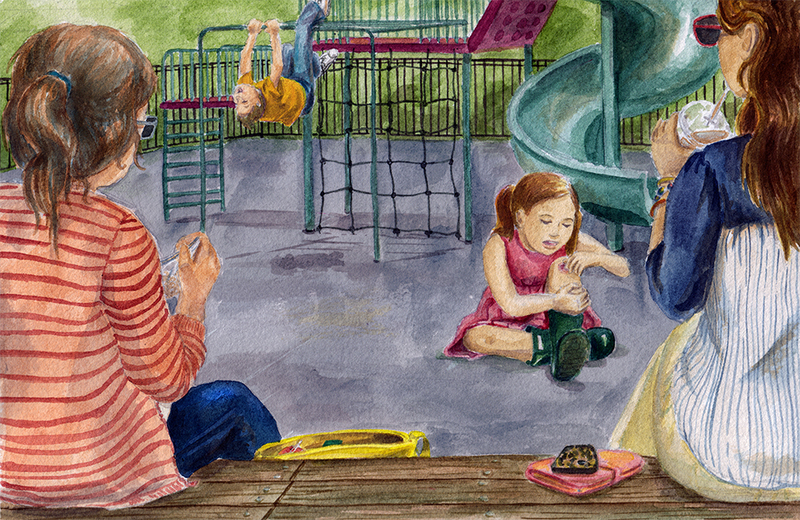 Something that adds to the complexity of child care in our situation is flexibility. I have not started looking into daycare or anything yet, so I don’t know how flexible they are with our schedule. Could we take her three days one week and half a day the next? In a perfect world we would have access to a nanny or babysitter (or service that provides them) and we could call a few days in advance to get someone for the time we need. So that’s where we are for the time being. We are looking into all of our options and will hopefully have something sorted out in the coming weeks. We’re going to have to get good at interviewing babysitters.